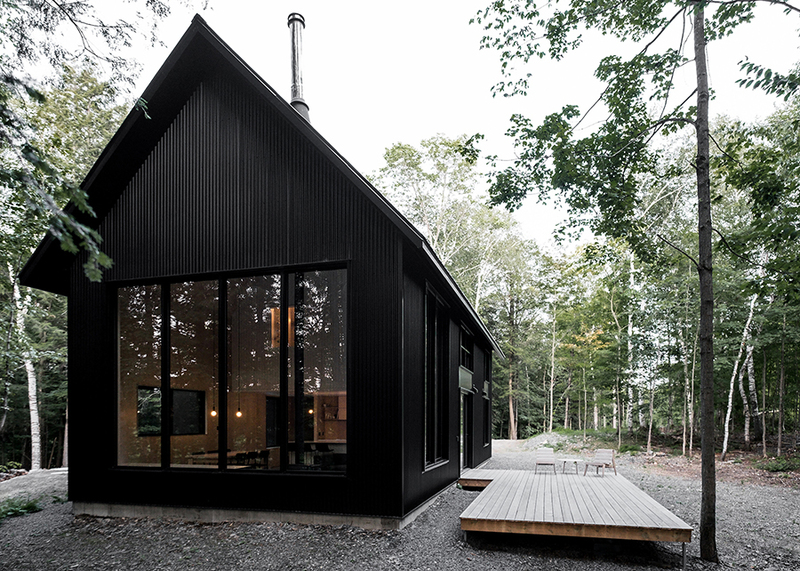 Nestled among the dense forest in Austin, Quebec is APPAREIL Architecture's Chalet Grand-Pic. This unique project, which featuring a pair of shed forms, is the combined effort of a team of architects, contractors, cabinetmakers, lampmasters, and designers. This is a multidisciplinary firm who believe that creative collaboration along with environmentally and socially responsible choices create refined, simple, and thoughtful structures that combine form, function, and aesthetic to improve the quality of life of its inhabitants. The Chalet Grand-pic’s perfect symbiosis with the landscape is a result of extensive research into the characteristics of the terrain, carefully chosen materials, and a solid sense of place - or placemaking. The forest's many ambiences and experiences were taken into consideration throughout the entire design-build process. As a result, the firm is able to proclaim that Chalet Grand-pic offers “thorough simplicity and sober physicality”. I couldn't agree more! The shed vernacular is well-suited to this setting, where the steep pitch roof ensures rain and snow is easily expelled. 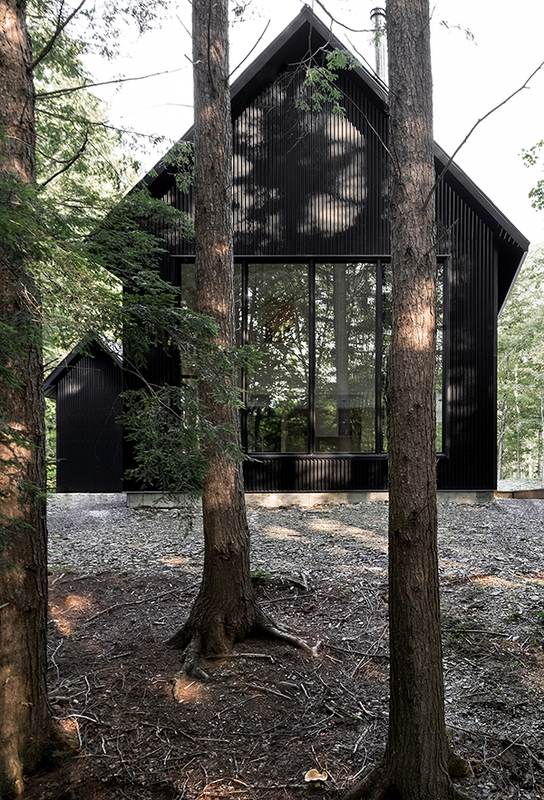 The tall columned windows wrapping the facade frame views of the surrounding forest, while playfully mimicing the shape and height of its trees. 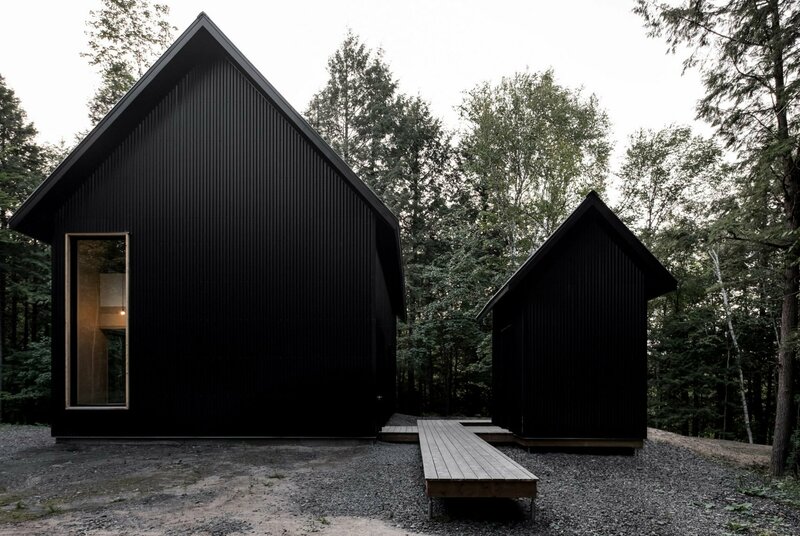 The rich black finish applied to the corrugated galvanized metal on both structures doesn't overpower the setting, but rather provides a quiet and understated complementary fortitude. The two structures - a dwelling and storage shed - are connected by raised cedar decking. The narrow plank walkways evoke the feeling of a dock, as one sees with many cabins on lakes. This promenade into the landscape forms a physical connection that reinforces the symbiotic relationship between shelter and place. 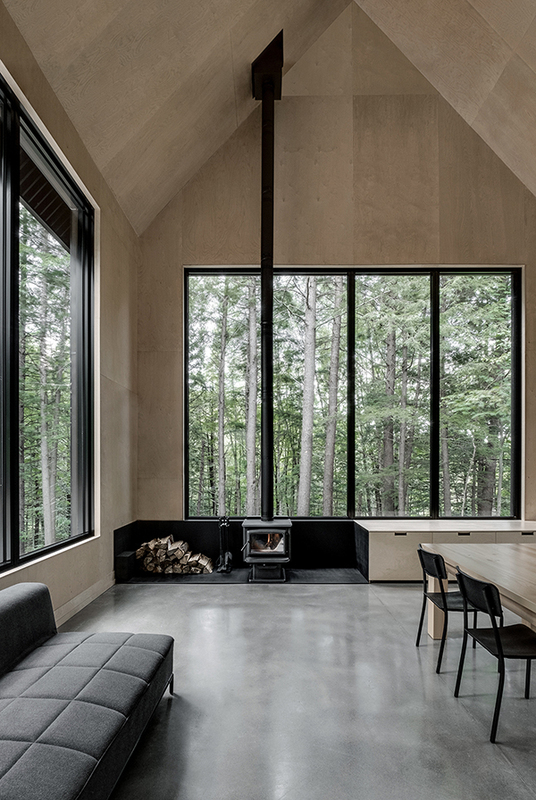 The aesthetic of the landscape is 'brought inside' by a simple palette of natural materials. Concrete, metal, wood and glass anchor the rusticity of the site, while the clean minimalist execution of the materials instills a contrasting order. The result is an equally weighted relationship between between inside and out, each simple and complex, akin to ying and yang. Within the dwelling a second level accommodates a sleeping sanctuary with two bedrooms and a bath. Comprising half the volume of the pitched roof, this space playfully floats within structure. I love the white beadboard and cut-out windows, which harken to the materiality of vintage Canadian farmhouses and our east coast vernacular. 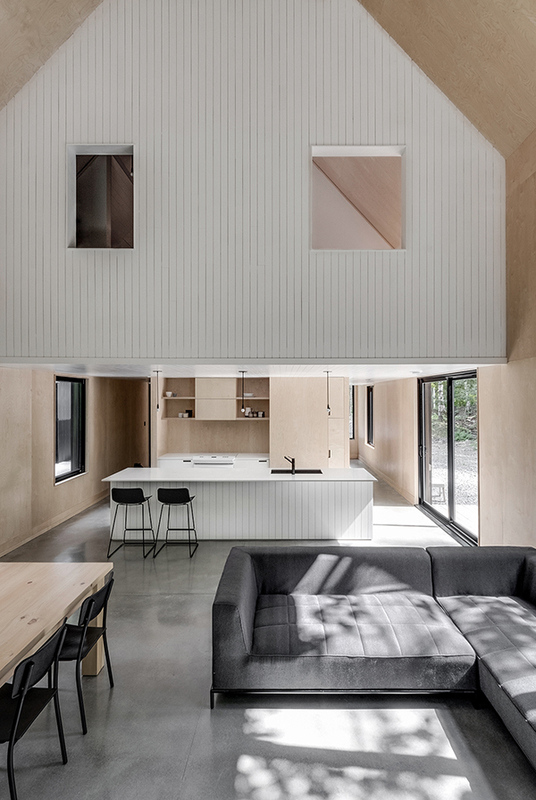 The Chalet Grand Pic by APPARIEL Architecture certainly lives up to its name offering residents a stunning view of Austin, Quebec’s lush forest and the icy glacial Lake Memphremagog. 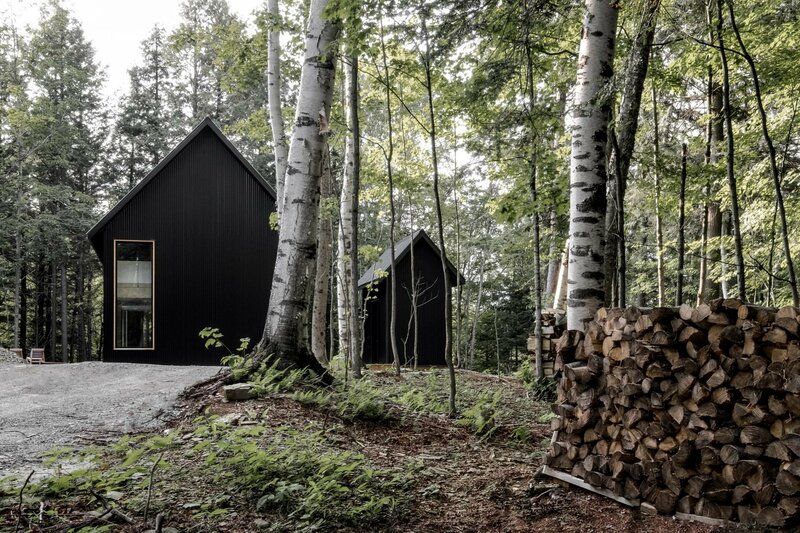 The strong visually-arresting exterior contrasts with the natural but polished interior, allow the form to both blend in, and stand out, in its Canadian landscape. This project masters the celebration of place. Visit their website to see more projects by APPARIEL Architecture. Researched and written by Amanda Salmon, a Bachelor of Fine Art Graduate from the Alberta College of Art and Design.